Charles Dickens and Furnival's Inn. Charles Dickens rented rooms at Furnival’s Inn between 1834 and 1837. This was also his first matrimonial home and birthplace of his first child. A plaque now marks the former site of Furnival’s Inn. Furnival’s Inn was founded before or during the reign of Henry IV and would have originally been attached to the Inns of Court and used as offices for the clerks of chancery. The Inn was dissolved as a society in 1817 when Lincoln’s Inn did not renew its lease, and the Inn was completely rebuilt by its new owner. It was demolished less than eighty years later. Charles Dickens and Furnival’s Inn. Image of Furnival’s Inn from 1828. Charles Dickens rented rooms at Furnival’s Inn between 1834 and 1837, and began to write the The Pickwick Papers whilst here. 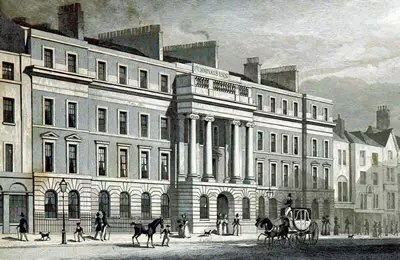 After his marriage in April 1836, Charles and Catherine lived in his lodgings. The illustrator Robert Seymour was invited to meet with Dickens at his lodging at Furnival’s Inn on 18 April 1836, whilst working on the third installment of The Pickwick Papers. The meeting was tense and Dickens demanded that Seymour change his illustrations. Two days later, apparently distressed that his idea had been usurped, Seymour was found dead in his summer-house in Islington. Charles and Catherine had their first child, Charles Dickens Jr. (also known as Charley), during this time, in January 1837. But the need for more space and an increasing income through his writings meant that within a year of his marriage Dickens was able to move his new family to larger premises in Doughty Street just two months after the birth of Charley. The last buildings from Furnival’s Inn were demolished in 1897, Between 1885-1901 an office block, designed in the Gothic Revival style by Alfred Waterhouse, was built for the Prudential Assurance Company. It is now the Holborn Bars building. Furnival’s Inn was listed in 1972 and is currently recorded as a Grade II* listing by English Heritage (list entry: 1379064).